With the creation of the A3DW, a test has become available to which the often mentioned critical comment does not apply that spatial perception tests are not suited for a comparison of gender specific performance as men and women use different task-solving strategies. 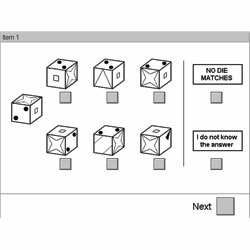 This Rasch-homogeneous and adaptive test assesses the (non-verbal) ability to perceive and transform spatial elements (spatial perception) for both adolescents aged 13 years and over and adults. Main areas of application: performance-oriented aptitude diagnostics, counseling regarding school, college, and career, traffic psychology, aviation psychology, clinical psychology, industrial and organizational psychology, and research. Spatial perception is one of the primary intelligence dimensions. The unidimensionality (Rasch-homogeneity) of the A3DW was proven in many empirical studies. This means that the same latent ability dimension is assessed in all respondents. Thus the criticism that spatial perception tests are usually not suited for a comparison of gender-specific performance due to the fact that men and women use different task-solving strategies, does not apply for the A3DW. Probabilistic characteristic values were estimated for the items. The resulting item pool allows for an adaptive test presentation with all advantages provided by modern computerized diagnostics: shorter administration time with increased measurement precision and highly motivated respondents due to an adequate and personalized item selection. The presentation of items is adaptive. It is not possible to omit an item or to return to the previous one. The 8 answer options are designed to reduce guessing to a minimum. There are three test forms that vary as regards the precision of the person parameter estimation (PAR). The screening offers a quick overview, when testing a person does not have any consequences to him / her (e.g. for students where spatial perception is assessed as an additional control factor). The long form S3 should only be administered in special cases, where increased measurement precision is of great importance (e.g. in court assessments). The increased measurement precision obviously extends the administration time. The person parameter of the variable "Spatial perception" is determined as characteristic test value. The internal consistency is given due to the validity of the Rasch model (applied to all pool items). The numerical values of the individual samples and reliability coefficients determined by various methods (split-half; Cronbach's Alpha) vary between .82 and .91. The retestreliabilities amount to r=.61 in school students that were retested after 21 months. Numerous results of statistical correlation analyses and inter-group comparisons (including other tests and various external criteria) back up the convergent and discriminant validity of the test and allow a differentiated judgment of the A3DW with respect to various validity aspects. Just to mention an example: Students from technological colleges have significantly higher results than students from non-technological colleges. Arrer (1992) showed that the paper-and-pencil form of the 3DW is also valid for the computerized version of the test. The A3DW thus provides representative norms for Austria (N=4064), both gender specific and not, and categorized according to specific school types and grades (=age-equivalent); students: N=432; adults: N=161).